What's New for the Chandra Source Catalog? 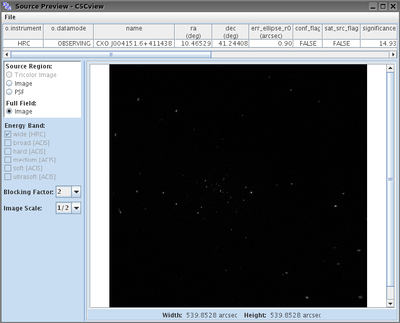 Source properties - such as fluxes, variability measurements, and spectral fit results - and data products - event files, images, spectra - from CSC 2.0 are being made available to the community as they are processed. Data access is via CSCview or ADQL, and the current processing-status page provides an overview of the available data. While all sources have undergone standard quality assurance evaluations, some may be deleted or have their properties revised as a result of further quality-assurance analyses step prior to the official CSC 2.0 release. 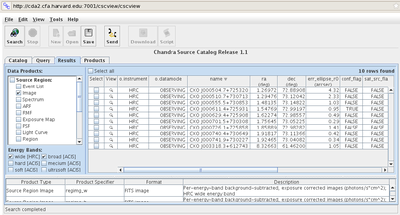 The pre-release of the Chandra Source Catalog 2.0 is now available. Please see the caveats for this release before use. It adds source designations (name, position and error, and an estimate of the average flux) to the pd2 detections list. The latest release of the preliminary-detections list of the Chandra Source Catalog 2.0 is now available. Please see the caveats for this release before use. It supercedes the pd1 release from March 2017. The initial release of the preliminary-detections list of the Chandra Source Catalog 2.0 is now available. Please see the caveats for this release before use. It supercedes the pd0 release from August 2015. The first preliminary detections list from release 2.0 of the catalog has been released to the community. Users will now get a pop-up box alerting them if a newer version of the application is available. or if the application detects any connectivity problems. In addition, the VOtable output format has also been updated to correct problems in the schema location attribute that could have caused problems for applications trying to make use of those attributes. Finally, the "G" format has been replaced with "E" as per the VOTable v1.2 recommendation . The CSCView Java applet is incompatible with Java version 7. This release provides a stand alone Java .jar file that users can now download that can be run with either Java 6 or Java 7. There is also a new Mac .dmg file that can be installed as a stand alone application. There were also two other bug fixes: the unit string returned for the flux columns incorrectly identified the units as erg/s*cm^2 and photons/s*cm^2 when they are actually in units of erg/s/cm^2 and photons/s/cm^2. The values are correct; simply the unit string was in error. There was also a bug fix that prevented queries that contained date/time values, ie gti_obs, from working properly. CSCview now features a crossmatch function which allows you to locate CSC counterparts to sources of interest by uploading, transmitting, or directly entering a table of source positions (and optionally, position errors) to the GUI. To use the CSCview crossmatch, launch CSCview from the CSC homepage and select "Crossmatch" in the lower-right corner of the Query tab. For help using the crossmatch, refer to the CSCview help page. The CSC-SDSS Cross-match Catalog, the CSC Sensitivity Map Service, and the CSC interface to Sky in Google Earth have been updated to access release 1.1. 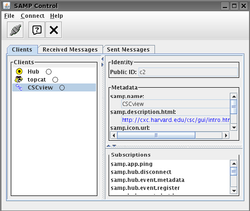 CSC release 1.1 became available on 11 August 2010. This version extends release 1.0.1 to include point and compact source data extracted from qualifying HRC imaging observations from the start of the mission through December 2009, in addition to recently released 'catch-up' ACIS observations. A new version of CSCview also became available with this release. 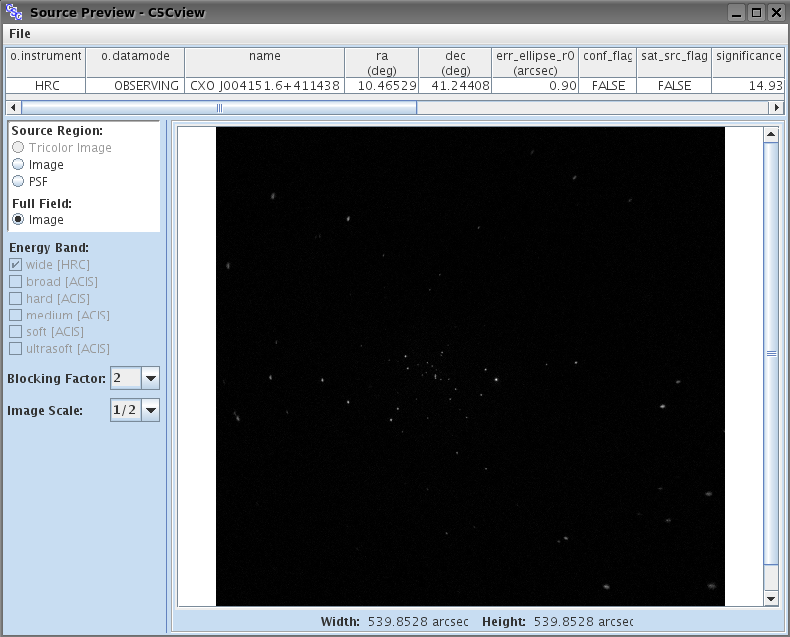 CSC release 1.1 includes 655 new ACIS imaging ObsIDs (-120 degree data only) and 625 HRC-I ObsIDs. There are 106,586 distinct (i.e., "master") sources currently in the catalog, up from 94,676 in release 1.0.1. Of these, 104,628 were detected only in ACIS observations; 1,034 were detected only in HRC-I observations; and 924 were detected in observations made with both detectors. The "source observation" properties derived from 158,071 source detections in 5,110 Chandra ObsIDS - 152,296 ACIS sources and 5,775 HRC sources - contributed to the "master source" properties contained in the catalog. Source properties in the catalog which are provided per CSC science energy band include the HRC wide band (0.1 - 10 keV), e.g., flux_aper_w, in addition to the ACIS u, s, m, h, and b energy bands. 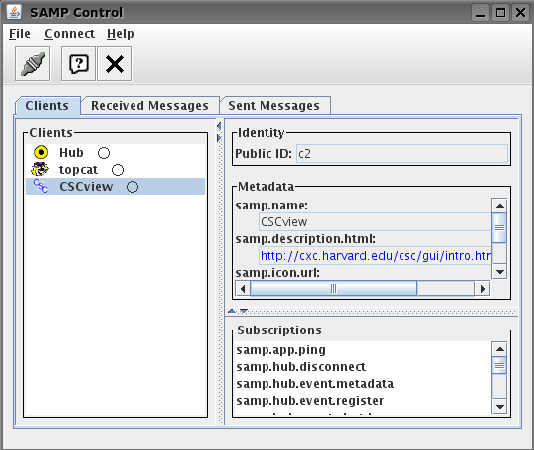 CSCview, the CSC data access GUI application, now supports a SAMP connection via the Send toolbar option. This feature allows you to transmit tables of source data and data files returned by a CSCview query to compatible applications such as SAOImage DS9 and TOPCAT, as demonstrated in the CSC threads. It is now possible to save a table of CSCview query results in both Tab Separated Values (TSV) and VOTable TABLEDATA format, replacing the Relational Database (RDB) format output by CSCview in release 1.0.1. See example save files cscresults.tsv and cscresults.vot. 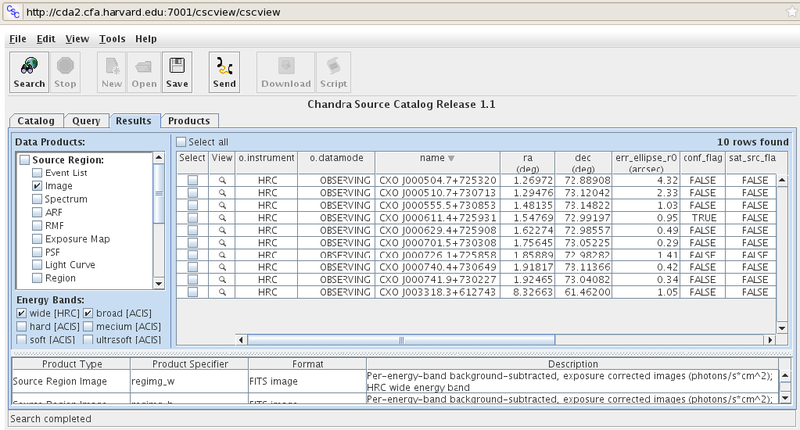 A new metadata display at the bottom of the CSCview Query and Results tabs lists the name, data type, units, and description of selected source properties, and the product type, product specifier, format, and description of selected data products. The CSCview Results tab now has a Source Preview feature which allows you to view and save images of sources in selected rows of a query results table. Source region images available in Source Preview include a tricolor soft-medium-broad (red-green-blue) events image, a single-color events image in any of the selected CSC energy bands (ultrasoft, soft, medium, hard, broad, wide), and a PSF image in any CSC energy band. The full-field broad-band events image is available at different blocking factors; they are 1, 2, and 4 for ACIS data, and 2, 5, and 12 for HRC data.